This is a non commercial website. I hope you enjoy your visit and bookmark the site to keep coming back! Your suggestions are greately appreciated. We supply the Best Mineral Specimens straight from our Alaskan mines at wholesale prices. Alaska Garnet Mines is owned and operated by Istvan Toth - Miner, Wholesaler and Mineral Dealer. Wholesale Prices! Unique Australian Aboriginal Art. Buy hand carved and painted Didgeridoos, Boomerangs, Jewellery, Rainsticks,Aboriginal Art paintings, Frog Callers, Bull Roarers, Boomerangs,Clap Sticks and lots of other unique gifts and gifts for men. Designs by Australian Aborigine Stan Yarramunua from the Yorta Yorta tribe. Orders shipped worldwide. CfM - Fernando Metelli mineral collection. Minerals hobbyist, I collect Italian and foreign specimens, with regard to aesthetic and macro-dimensioned pieces. This is a non-commercial site devoted to my collection and to all minerals collectors. The site is regularly updated, with the addition of new photos. I hope you enjoy your visit and you are invited back at any time. We provide Crystals, Gemstones or Minerals chosen for their Healing properties as well as their beauty. Our emphasis is on quality. For Quality Cornish, Devon, UK and World Minerals, plus an Auction Page. Site Description: Wordlwide fine minerals at affordable prices, many from classic localities. Minerals from Spain and Portugal. Purveyors of fine specimens from around the world.Quality specimens from large miniature to large cabinet size. Interesting minerals, all sizes and prices. Interesting italian collector personal website. I collect, sell, buy and exchange fine, as well as good quality, Mineral Specimens (especially 19th.C Cornish items) and additionally, World Cut Gemstones (Precious and Semi-Precious) and Fossils. Exclusive Distributor of Amazon Opal! Crystals and Minerals from Southern Africa and other parts of the world. Swiss portal of mineralogy (in german). SYSTEMATIC MINERALS COLLECTOR - RARE SPECIES WORLDWIDE. Mindat.org is probably the largest mineralogical reference on the internet. It was started (as a DOS database) by Jolyon Ralph in 1993 - and was launched for free on the web in October 2000. Currently there are 9595 different minerals, varieties and synonyms listed, and information on 39450 mineral occurrences worldwide, from 6780 different sites. Home-page of the Mineralogy Club of Antwerp, Belgium. Informatio relevant to mineral collectors, with lots of links to other mineralogy or earth science related sites. My homepage was created with the purpose of giving other "rockhounders" an opportunity to take a look at pictures of some of my minerals and trps around Norway collecting them. crystals and carvings for sale, on line auctions as well. We are amateurs collectors and we propose some specimens, doubles and pieces from France and other countries. I have been a mineral collector for more 30 years (from 1976), I have accumulated experience and knowledge and to see that i have so much more illusion that at firts, it has made me to decide to celebrate it creating this web page to share it with the friends of the mineralogical world my own personal satisfaction. SHOWY AND UNUSUAL MINERALS... SELECTED AND OFFERED WITH AN INTERESTING CREDIT-BONUS POLICY !!! Your online mineral site for southern african and international minerals specimens. Opals Guaranteed for Australian opal, opal jewelry, black opal and opal rough. Also features a knowledge center and popular monthly opal newsletter. Dealers of fine mineral specimens, primarily from Central Asia. Pacific Rim Gem and Mineral LLC has spent time establishing a network of contacts in an effort to bring you some of the finest minerals at very affordable prices. Visit our website and compare our the quality and prices of our minerals to other on-line dealers. 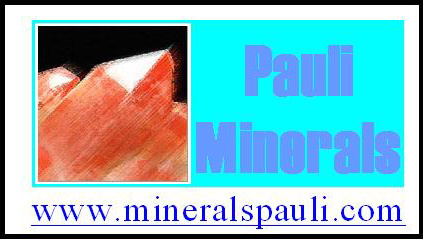 World wide mineral collection - with on-line purchase order form, message boards and Mineral. for a good home, never to late to become a rock hound. High quality World Wide minerals. Russia and the former USSR territory, Italy, and Switzerland. At socalgem.com you will find exceptional colored stones including tourmaline such as rubellite, indicolite, verdelite - garnet varieties including spessartine - beryls such as aquamarine and emerald - spodumene including kunzite - as well as beautiful jewelry and fine carvings. We, at the Mineral Mall, will endeavor to offer you, the mineral collector, highly desirable mineral specimens at affordable prices. Each mineral specimen that we purchase for resale will be individually selected with you, the collector, in mind. We will strive to do our best to make your visit to the Mineral Mall an enjoyable experience. Top Site List - lot of good mineral sites !! Alot of fluorites and other good minerals for collectors. Dealers in quality mineral, rock and fossil specimens for your collection, from beginner to advanced.